Hayley Tompkins is a Reference Librarian at the Central branch of Central Virginia’s public library system, the Jefferson-Madison Regional Library. She sat down with me to discuss the free writing opportunities offered at the library. Their critique group operates under different circumstances than BACCA’s, and, as with our interview with Elizabeth SaFleur, proves again that there’s no single correct way to conduct a critique group. Describe the writing opportunities that the library offers. I understand you host both creative writing groups and critique groups. The Jefferson-Madison Regional Library offers a lot of activities for writers of all ages. Last year I began a Creative Writing Group at the Central Library in downtown Charlottesville, Virginia, which meets the third Wednesday of each month at 6pm. It’s a great group. Adults can come and stretch their creativity with writing prompts and activities that I provide each month, and we dedicate swatches of time to writing. After each prompt, you can opt to share it in a non-judgmental environment. It’s been a lot of fun. Our Writing Critique group grew out of that – as a way for writers to come together and get feedback on previously written work. That group now meets on the second and fourth Wednesdays of each month at 6pm. Just recently the Northside Library’s Reference Librarian Abby Cox has also started a Creative Writing program on the first Tuesday of the month at 6:30pm. That means that collectively, the Library offers a free writing program for writers in the Charlottesville area every week. Every week, the Library offers a free writing program for writers in the Charlottesville area. And for younger writers, there are teen groups: Crozet Library has Musings – a writing group for teens that has been meeting for several years. I started a Creative Writing group at the Gordon Avenue Library in 2012, and that has continued as well – it’s now called the Teen Writer’s Guild and it meets monthly on Thursdays in the summer. Teen and children’s events on writing and cartooning have also been offered as one-time workshops. Are there other activities for writers at the library? In addition to writing groups, Central Library also hosts a Regional Author Series in the Spring and Fall. Published authors come to the Library to discuss their books and writing and it’s a great opportunity for writers to talk with authors about writing tips and their experiences with publishing. We have had some great local authors, most recently Corban Addison (A Walk Across the Sun) and mystery author Andy Straka (Frank Pavlicek series). I decided that I could better reach people who weren’t already using the Library as a place to write by creating a group on Meetup.com. How did you go about telling people about the JMRL creative writing group and the critique group? How did people find out about it? At first, we started with flyers up around the Library and on the Downtown Mall. I decided that I could better reach people who weren’t already using the Library as a place to write by creating a group on Meetup.com – an online community that connects people with groups through common interests. Now there are 115 people in the Meetup group, from all different backgrounds, although we haven’t had more than 18 in any one writing session. Some are professional writers, some are just beginning. All levels are welcome, and it’s really helped us diversify the types of people who come to the meetings. You can find that group online. What do you write? How long have you been doing it, and how did you begin? Fluvanna County High School – Go Team! I don’t have just one thing that I write. I have been writing pretty sporadically since elementary school, but a creative writing class at Fluvanna County High School really sparked my interest (thanks, Mrs. Calhoun!). I wanted to bring that same love to teens at the Gordon Avenue Library when I did teen library programming, and when I started doing adult programming at Central Library, I knew that I wanted to create the same space for adults who wanted to find and keep up with their own writing voices. How many of you are in the creative writing group? Has the membership stayed the same, or do people come and go? How long have you been together? It varies each month. The most we have had is eighteen. The fewest we have had was two! We have several members that come regularly, and a lot that come and go. I started this group in July 2014, and it’s been meeting monthly since then. In the critique group, what are the ground rules? Do you have guidelines, or have you collectively found your way with these matters? Do you write up formal critiques, or is it more conversational? In the Writing Critique Group, everyone brings in a short sample of his/her work – usually two pages or less. You give a copy of your writing to everyone, and then read it aloud, and the group discusses it. You get feedback on the piece – how it conveyed to the audience, what worked, and what could use improvements. You give similar feedback to others during their turn. There aren’t specific guidelines about how to critique, or how to structure comments. It’s a relatively small group – with the highest attendance being six people. They are informal and conversational – but very constructive. 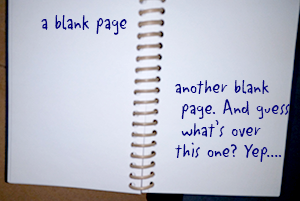 Don’t let this blank page stare you down. Join a writer group! Linda Kobert is a fellow writer from the Creative Writing Group, and she helped set this Writing Critique, and attends regularly. She’s got great advice, so if you are new to the group, she’s good at helping you understand what to look for in the piece, and what kinds of comments to make. I wasn’t able to attend for the first few months, and I was really nervous – I’ve never really had peer feedback on my creative pieces. This was very new territory for me, but all of the feedback really helped me see my work in a new light, see some great things about it, and also what could get better, and where to focus my energy. I left feeling exhilarated and ready to get back to writing. Is someone the leader, or is it more collaborative? With the Creative Writing Group, I organize it and create a handout for it. I introduce writing prompts or activities (all loosely structured so that if someone wants to go in a different direction, then that’s great too), and keep us on track so we get the most out of the time that we have. For our July 15th session, Linda Kobert will be leading a special memoir-writing workshop. I like to introduce various styles of writing, and since Linda has had experience with memoir-writing, she was the perfect candidate to tackle this. I would definitely consider other people who were interested in taking the lead. The Writing Critique is very peer-oriented, but Linda Kobert set it up initially, and is a good go-to person for questions about the Critique sessions. Life does get very hectic, and it’s nice to know that this block of time each month is carved out specifically for this, and it forces me to just do it. Have you developed friendships with members of your group, or is it important to you to maintain a separation from the rest of your life? I do consider myself to be friends with these writers, although since the Library is also my place of work, I think sometimes it takes a while for the worlds to mesh. How has being in your writer group changed your writing? Your attitude about writing? Your identity as a writer and your plans for the future as a writer? Being in a writer group has dramatically improved my writing – it’s more inspired, more deliberate, and knowing that other people will be reading it really encourages me to do better than I do on my own if I’m not sure it will ever be seen. My attitude is also a lot better – I’m much more confident and excited about my writing. Life does get very hectic, and it’s nice to know that this block of time each month is carved out specifically for this, and it forces me to just do it. Do you have recommendations for other writers? Just keep doing it! Use the Library and its resources to help you – we have a group for you, and books to keep you inspired. We also have quiet spaces for you if you need a space to write without the distractions of your own home. If you could change anything about your writer group as it is now, what would you change? I would love to have more consistency in the numbers of writers each month! It’s hard to do some of the more fun activities with just a handful, and I love new blood, so I’d really like to encourage new writers who want a dedicated group to come out. We also have quiet spaces for you at the Library, if you need a space to write without the distractions of your own home. What are the next steps for you in your writing career? Well, I am a Librarian full-time, so writing is a lovely diversion for me. But, for my next trick, I am definitely going to do NaNoWriMo in November. I started last year and didn’t finish, so I think that’s my next step. I also have a lot of pieces of stories – mostly things that started here at our Creative Writing Group, and I would like to bring those to more fully-realized works. How do people find your creative writing group? Are you accepting new members? When and where do you meet? We are always accepting new members! Find us by stopping by the Central Library on the third Wednesdays of the month at 6pm, or find individual events at our Meetup page. If you have any questions, you can reach me, Hayley, at the Central Library at 979.7151 x4. We typically meet in the Madison Room at the Central Library. What about the critique group? Can new writers join? If so, what are the steps, and the schedule and location of meetings? Again, yes! New members always welcome. Find individual dates listed at Meetup, and more details are posted there as well. All you need to bring is an already-written piece, a pen, and yourself. We’ll make copies for you at the Reference level of the Central Library just before the meeting if you need. The Writing Critique generally meets on second and fourth Tuesdays at 6pm at the Central Library. Thanks so much, Hayley, for taking the time to tell us about what the library offers local writers. Like you, BACCA loves to encourage writers to get in touch. Anything else before we close? Nope! I think that about covers it – thank you so much for interviewing me and helping me get the word out about how the Library can help writers in our area! — A M Carley writes fiction and nonfiction, and is a founding member of BACCA. Her company, Chenille Books, helps nonfiction authors develop their books.